History shows that there's no right way to raise income taxes – but generally it's smarter to eliminate preferences, deductions and loopholes rather than jacking up rates. It’s hard for any American nowadays to imagine living in a country with no income tax. But up until 100 years ago – exactly 100 years ago this weekend, in fact – it wasn’t constitutional for the Federal Government to tax individual incomes. Indirect taxes, such as tariffs on imports and sales taxes on specific kinds of goods, were allowed by the Constitution as long as they were uniform throughout the country. But direct taxes had to be apportioned among the various states in proportion to population, which is impractical with income taxes. Once Delaware ratified the 16th Amendment on Feb. 3, 1913, however, those restrictions were eliminated and the income tax we know today came into existence. The income tax has always been hated – but so were the taxes it replaced. In Colonial America and the early U.S., taxes were typically on goods like sugar, tea, or whiskey (which triggered the Whiskey Rebellion in 1791). Other taxes were on land or were poll taxes (which was a flat amount per person and had nothing to do with voting). Later on, there were high custom duties on imports, which were one of the chief causes of the Civil War because they pushed up the prices of manufactured goods, helping the North but hurting the agrarian South. Real estate taxes were always extremely unpopular and still are. Raising taxes on the rich has been the strategy from the beginning. Income taxes were imposed twice before the 16th Amendment. The first time was to help pay for the Civil War. That tax began at 3% for incomes over $600 ($13,636 in today’s dollars) and 5% for incomes over $10,000 ($227,273 today). Two years later, the top rate was doubled to 10%. This tax was ended in 1872 and largely replaced by taxes on tobacco and alcohol. The income tax was revived in 1894, and it exempted incomes below $4,000 ($105,263 in today’s dollars). This version was ruled unconstitutional by the Supreme Court in 1895. There is no “fair and reasonable” top tax rate. Since the modern income tax began in 1913, top rates have varied enormously. Initially, the top rate was 7%, but it rose rapidly during World War I – to 77% by 1918. After the war, the top rate was cut repeatedly down to a low of 24% in 1929. During the Depression, the top rate went back up to a high of 79% – and then climbed further during World War II to a peak of 94%. The top rate was reduced to 70% during the 1960s. The Reagan tax reforms cut the top rate roughly in half and since then it has ranged from around 30% to 39.6%. The history of taxes is the history of loopholes. The government has always offered tax breaks to spur the economy. Some of these can be used to craft ways of avoiding income tax. Oil companies are allowed to deduct a large percentage of their drilling costs in the first year, for instance, and real estate investors can deduct depreciation for their properties. Prior to the 1986 tax reform, limited partnerships could invest in such businesses using a lot of borrowed money and thereby generate tax deductions three or four times larger than the amount of cash invested. With today’s lower tax rates and tougher regulation, such tax shelters are less common. Federal income tax is only part of the total tax take. Government revenues from all sources rose as a percentage of GDP until World War II. Since then, Federal revenue from all taxes has fallen from 23% of GDP to 18%. Nonetheless, there has been an increase overall, from 30% to 34%, because of huge increases in state and local taxes. Moreover, payroll taxes for Social Security, Medicare and the like have risen tenfold just since 1975. High rates don’t necessarily increase taxes on the rich. Back when top tax rates were very high, the rich actually paid a smaller share of income taxes than they do today. 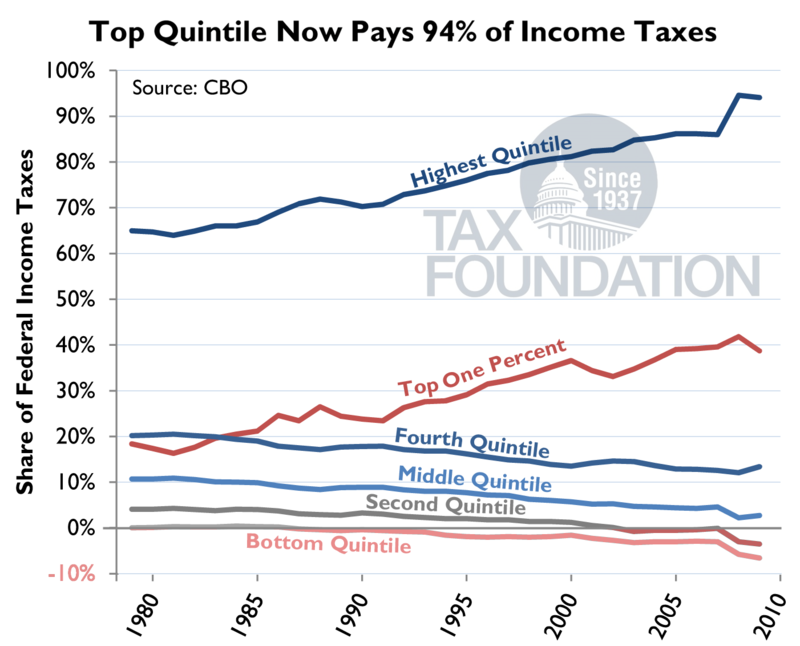 Moreover the share paid by the top 20% of the population has steadily climbed over the past 35 years, even though tax rates have come down. There are three reasons for this. First, when rates are high, top taxpayers make a greater effort to find loopholes. Second, taxation has steadily been shifting away from Federal income tax to payroll taxes, user fees, and state and local taxes, some of which are less progressive. Finally, the rich are paying more income tax because income inequality has grown so much – rates may be lower, but the rich have a lot more income to tax. There are a few conclusions to be drawn, which may help make the ongoing tax debate more constructive. All taxes are unpopular, but modern states need a lot of money and there is no painless way to raise it. Income taxes have to be viewed in context – both relative to the total system of raising government revenue and to trends in income. There is no “correct” set of tax rates, and high top rates don’t necessarily raise a greater share of revenue from the rich. It is more efficient economically to widen the tax base (by eliminating deductions and preferences) rather than raise rates. In the end, though, the debate over tax rates will be driven not by policy considerations, but by the government’s need for money, the general level of prosperity – and a dollop of envy and resentment.